Enhance the possibilities of the native Magento layered navigation with wide options for navigation fine-tuning. See it in action (with popover)! See it in action (without popover)! Improve the native layered navigation functionality with 20+ additional options! Give customers an easy and quick way to find the required products. Fine-tune the default state of each filter (expanded or collapsed). Choose between the single-select (for the category filter only) and multi-select modes. Hide unavailable attributes from a view. The native layered navigation doesn’t allow picking several attributes at a time to sort items more precisely. In our module, filters can be applied in two ways. 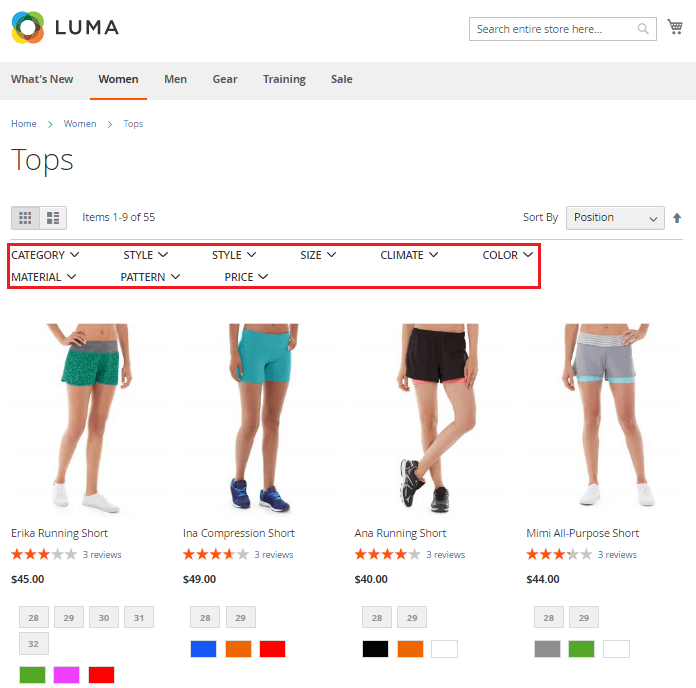 With the Magento 2 Layered Navigation extension, you can select multiple product filters at once. In addition to the multi-select mode, we added the single-select one to the category filter. It serves as a navigation guide allowing customers to see where they are. On mobile devices filter scrolling turns into pain. With this in mind, we replaced scroll bars with the ‘show X more’ active link. Your customers can forget about infinite scrolling of long attribute lists. Let them view attributes in parts via the ‘Show X more’ active link. Our ‘Show X more’ active link works well on all device types. Try it on mobile! Our Magento 2 Layered Navigation module provides two methods of AJAX page refresh. You can choose the traditional page reloading every time a new attribute is selected. Alternatively, you can reload the page independently once the required number of attributes has been chosen (via the provided popover). During the filtering process, some attributes become unavailable and only unnecessarily distract users. 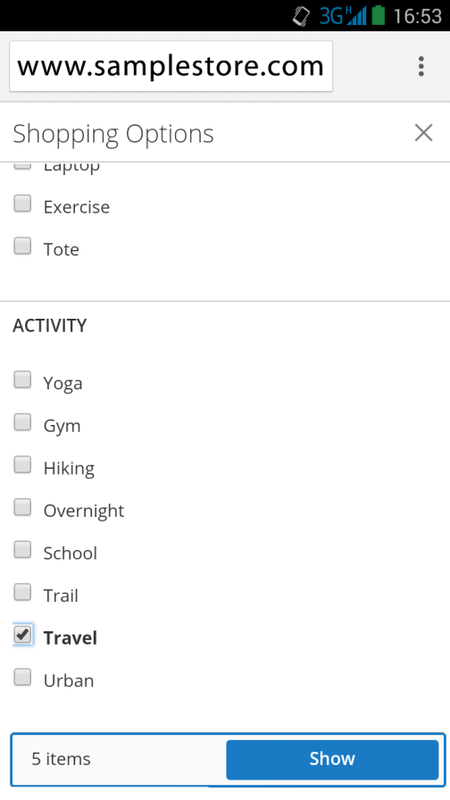 So, inactive attributes will not be visible now. The less distraction for a customer - the greater conversion. How does the Magento 2 Layered Navigation extension beat the competition? 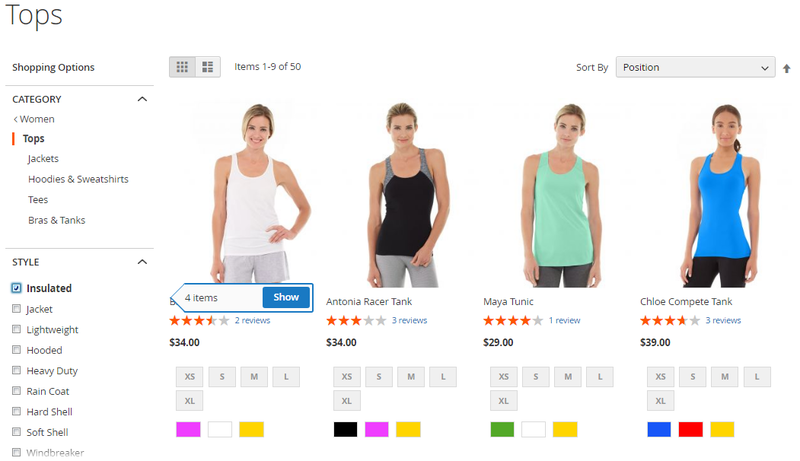 In a Magento 2 store that has the native product navigation functionality, the shoppers can’t select several attribute values within the same filter, which complicates the whole catalog navigation process and may result in increased rejection rates. With the Layered Navigation module, customers can easily find the required products without any difficulty. Let’s find out how the whole product catalog browsing process can be organized. 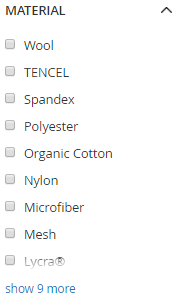 If your shoppers want to select several attributes values within the same filter, they can do this just selecting them one by one. Upon selecting every single attribute, the catalog block will be reloaded automatically with AJAX displaying items that match selected attributes. The Layered Navigation module also allows you to enable the Show X items pop-over that will be displayed upon each individual attribute selection. The pop-over shows the number of items matching the selected attributes and attribute options and saves customers from constant page reloads to view the matching items. Rather, they can apply all the selected filters with just one click on the Show button of the pop-over, thus, deciding themselves when to reload the catalog page. 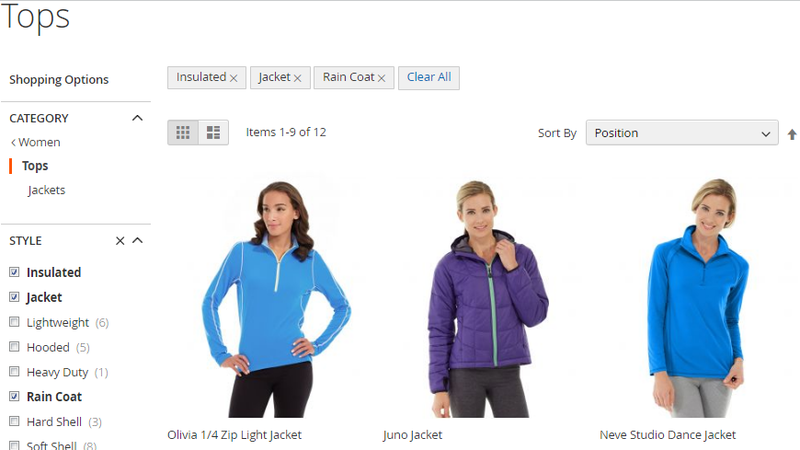 Let your customers find products in your store catalog smoothly and seamlessly by applying multiple category attributes. Simple and convenient navigation helps to increase conversion rates of any e-commerce store. Navigation usability becomes even more important if you consider the fact that 79% of visitors move to another retailer if the content of the store they currently browse is poorly optimized. Sometimes, extensive and complicated catalogs require sophisticated navigation functionality that is not always easy-to-use. The Magento 2 Layered Navigation extension complies with most of the industry usability standards and allows customers to browse product catalogs quickly and effectively. In addition to the default Magento 2 product filters, the module offers several new useful filter options, including ‘New arrivals’, ‘Discounted products’, ‘In-stock Items’, and ‘Price Slider’. 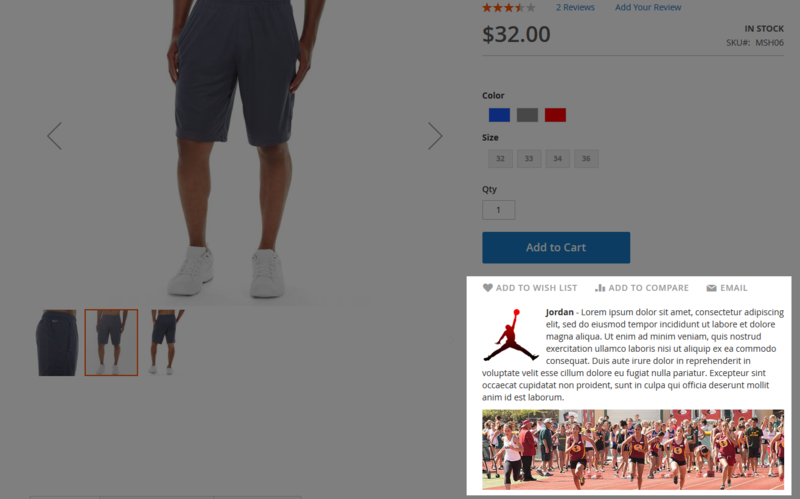 Long multi-attribute filters going beyond the fold of the page are extremely frustrating for customers, which ruins their flawless shopping experience. According to the statistics, 77% of people view only the content above the fold. The way to avoid this inconvenience is to collapse those multi-attribute lists to show only a limited number of attributes. When selecting certain attribute values, the module automatically hides void attributes and attribute values so that shoppers will be not distracted by them. Let customers find the products they need and reach the checkout without irritation. The statistics shows that 25% of customers leave online stores due to the complicated navigation. With the above-described feature, customers can successfully complete the filtration process, find the products they need, so they will likely return in this store again. The same as Magento itself the Layered Navigation extension uses LESS functionality that allows customizing navigation sections and adjusting them to the appearance of current Magento themes. The advanced functionality of LESS provides additional customization opportunities and makes the whole process simpler and cheaper. Follow the installation instructions in the user guide to make sure the extension is installed properly. Decide on how you want your Layered Navigation to look like and contact your developer team. Get Layered Navigation for Magento 2 prepared for customizations and Magento integrations. In addition to the core functionality, the Layered Navigation extension for Magento 2 also enables layout improvements that will fit the overall visual look of your store. 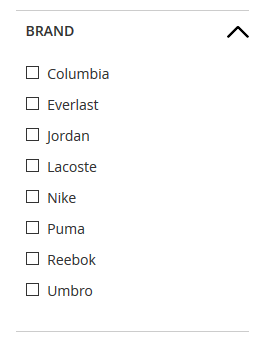 Perhaps, the most annoying thing of any catalog filtration is constant page reloads triggered by each product attribute added to the filter configuration. They take time and test your patience. Magento 2 AJAX Layered Navigation allows you to reduce that impact updating only a part of the whole page and making reloads almost invisible for customers. However, the module is able to further reduce the number of AJAX reloads to only one single code execution. Navigate to the extension settings and set the "Show X Items" Pop-over enabled. 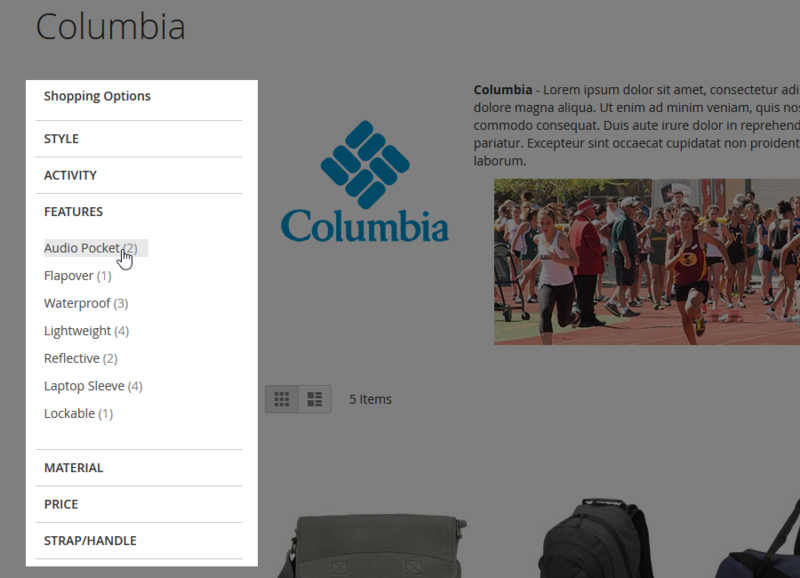 There are no additional steps, customers can now select multiple attributes and decide when to reload the catalog page. Make layered navigation intuitive and prompt without page and even AJAX reloads. If enabled, the ‘Show X Items’ popover allows customers to select all necessary attribute options and only then render the results by clicking the ‘Show’ button. Depending on the number of used attributes this functionality is able to save up to one minute per each filter by attribute procedure. 81% of customers search products online before they make a purchase. If they do not find the products they need in your store, they will change it for another one without any hesitation. The Layered Navigation module helps to avoid this. 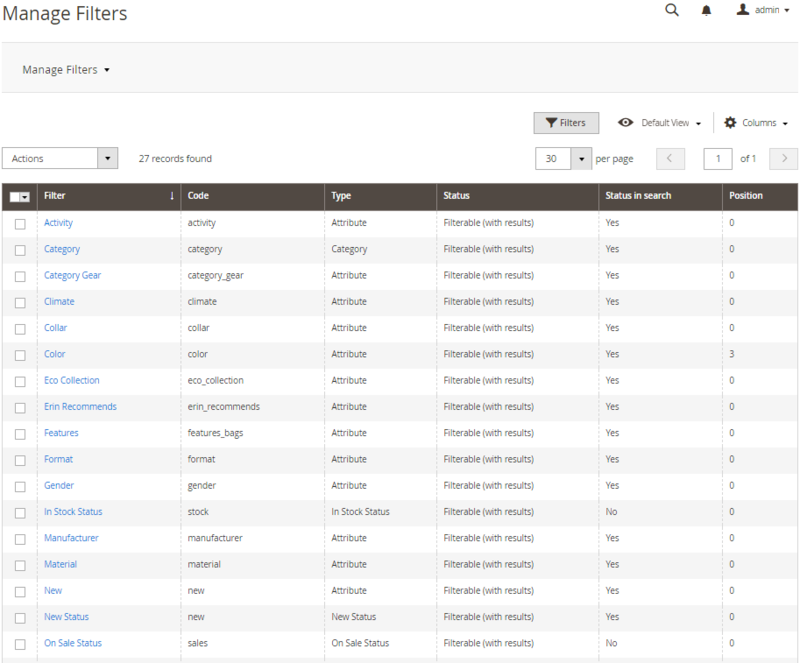 Manage all your filters on one page and sort them by Filter, Code, Type, Status, Status in search, and Position criteria. Only product catalog is refreshed, customers don't have to wait for full page refresh. 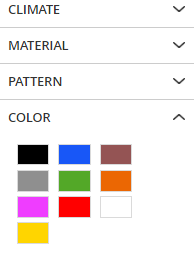 Let your customers select all required filters and decide to refresh the catalog pages after all or one only filter is applied. For the product categories with one-column design, the extension displays layered navigation filters horizontally. Decide how the URLs with the applied filetes will look: default, attribute values instead of IDs, or attributes as subcategories. Let web crawlers know that search pages should be avoided. Catalog pages with filters applied use attribute values for meta information. If some of your catalog pages with different URL types were indexed by search engines, the automatic 301 redirect will make sure that users are redirected from such pages to the relevant ones with Layered Navigation. For the category search pages, the meta robots tag can automatically include the NOINDEX and NOFOLLOW attributes to avoid duplicate content. Layered Navigation allows selecting multiple filters without reloading product catalog until the 'Show' button is clicked in the pop-over. 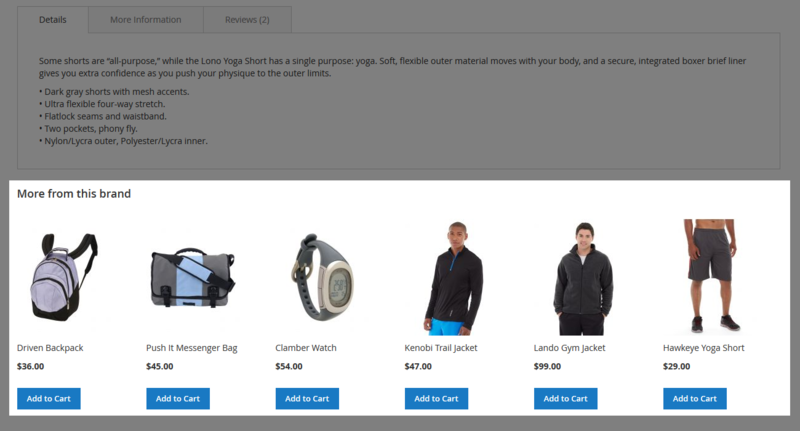 With Magento 2 Layered Navigation, your customers can reload product catalog after the required filters are applied. Merchants who sell products with multiple attributes can automatically sort those attributes alphabetically by the A-Z or Z-A order. With the ‘Select categories where to display the filter’ option, you can choose the categories where a particular filter will be available. For the customer’s convenience, attribute filters are presented in the checkbox, text field, button, and swatches formats. If the main filter applied doesn't have a particular child attribute, it will be hidden automatically. Product images are automatically updated depending on the selected color. Customers can remove any number of the selected attributes at the category level at once by clicking on the X button provided. Default filter condition setting NEW! Decide on the default look of each attribute list by choosing between the expanded (works well for short attribute lists) and the collapsed options. Single path category list style (Amazon-like) NEW! With the ‘Single path category list style’ option enabled, your customers can conveniently move from product categories straight to the related subcategories step-by-step with no multiselects. Instead of scrolling long attribute lists, your shoppers can now expand them by clicking on the Show X more active link. Let customers look for both M and L sizes of the same shirt. Product selection may be narrowed down to show new, discounted, in-stock items, and items within a particular price range. Let your customers disable applied filters conveniently. The option works only when the pop-over is disabled. Product pages can have a brand description and logo displayed. Give personalized look to all brands gaining customer's trust and catching an eye. 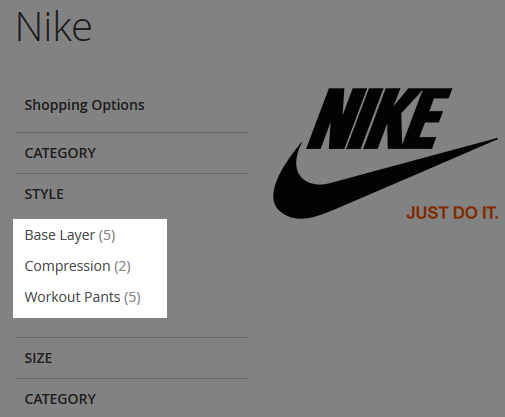 Brands are included in the Layered Navigation as additional filtering options. 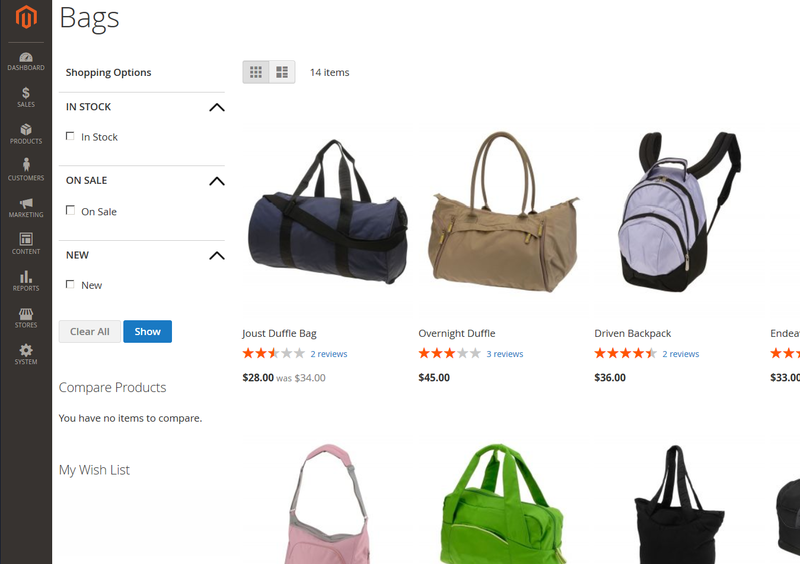 Product pages can display related products of the same brand sorted by multiple criteria. On the mobile screen, the interactive item count is displayed as a special count bar at the bottom of the page, which is less distracting and easier to interact with. As attributes are selected, an automatic pop-over shows how many items match the current selection. The Layered Navigation extension is integrated with our Advanced Search extension so that your customers are able to filter search results easily. Consider that if you purchase Layered Navigation together with Advanced Search, the latter one is available with the 50% discount off the regular price. The extension works both for catalog and for search result pages. Products can be displayed as a grid or as a list. 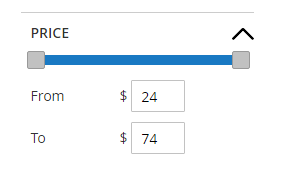 If the pop-over is disabled, the product count will be displayed in brackets. Would be nice to be able to enable or disable scrollbars in the extension options, but that's a really minor point to be honest. Buy it, you won't be disappointed. The flexibility provided with this extension truly impresses! Single-select for the ‘Category’ filter is elegant and convenient. Nuff said. Thanks to this module, I managed to give my customers exactly what they needed – superior navigation experience. And it actually worked great for my retention rates! 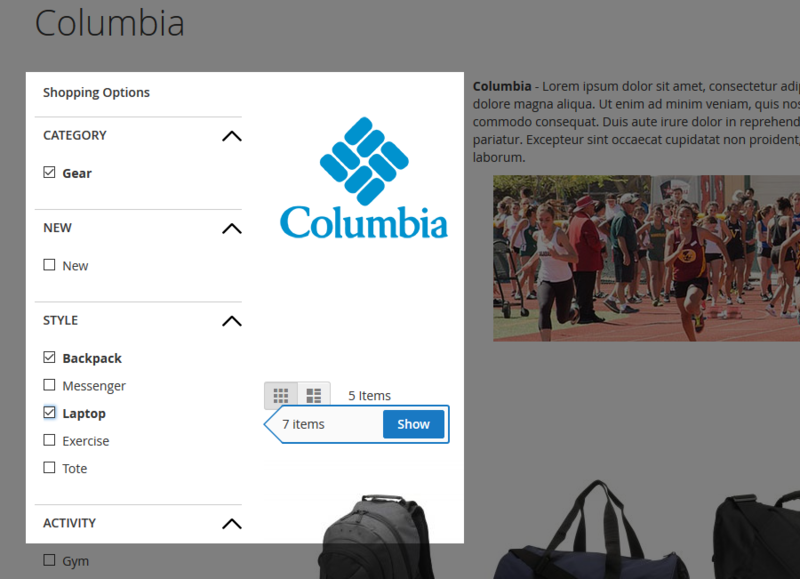 With the provided popover, they can seamlessly sort the catalog as they need without constant page reloads. Great solution, Aheadworks! Works just as promised! Filters are configured simply and quickly, and everything works like a clockwork in my store. 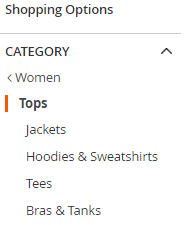 The possibility to adjust the navigation panel to the page’s layout is what I especially lacked in the native Magento, but now I can forget about this problem for good. Very good and immediate support from kind people. The plugin works like a charm! Great extension, does exactly what we want plus more! We had a few compatibility issues when first installed but aheadworks support, as always, sorted the issue very promptly. After a problem of compatibility with another extension, they solved the problem in one day, technical support is really effective. As usual Aheadworks did a quality job! I just want to say thank you for fixing this issue with swatches in Layered Navigation. This was a nice little gift for Valentine's Day. Great extension from a developer who cares about code quality. My client bought a different module from other developer but I'm not keen, prefer to stick to AheadWorks modules. I have over 5000 SKUs and the standard Magento 2 layered navigation is just not up to the task of sorting such a big catalog in a meaningful way for the visitor. This extension does the job very well thanks to the multiple select, extra filters and ajax loading. The included Shop by Brands is also very useful. For a full package i recommend AJAX Cart Pro extension also. Also the Aheadworks support is very good, really important for a website with many extensions and a custom theme. Good module, easy to setup. And support is top notch. I like its functionality. It helps customers find products they want easier and faster, and that exactly at what we aimed. It looks nice on our site. And it is easy and practical to use. Besides, I got a free installation service. Thanks, guys! You know your job! Using this for several months already and totally satisfied. Nice module, good work, AW! 2. aheadWorks listens to their customers. Also, a significant part of the code has been rewritten in the name of better compliance with Magento 2 guidelines, which, along with unit tests, makes an integration easier. As a developer, I can't help appreciating their way of updating the products. An extremely simple extension, but the one you can't do without. Virtually no setup required. I've been using this plugin for six months. It doesn't require additional configuration you have to worry about. Cool feature with an interactive frame. A bit frustrated about Ajax not included by default, hope to see it in the next update. Definitely recommend.